I first became involved with Chabad as a teenager in the early 1950s, when I went to work as a counselor at the Beth Jacob Day Camp in Philadelphia, the director of which was a Chabad chasid, Rabbi Aaron Popack. Several years later, I had to make a decision whether to accept a position teaching in an after-school Jewish studies program in a Conservative synagogue or in an Orthodox one, and Rabbi Popack was the person who suggested I solicit the Rebbe’s advice. So I wrote to the Rebbe, and his response to my letter was most surprising and impressive. Rather than advising me to teach in the Orthodox after-school program, which would hire a Torah observant teacher in any case, he said that if the Conservative synagogue was willing to hire me and allow me to set my own teaching agenda, then that’s the position I should accept. He said that I would see a lot of results and satisfaction from my work with the students there. I followed his advice and went on to teach in after-school programs of Conservative synagogues for almost fifty years. Over the years, I saw how right the Rebbe was – many of the families whose children were my students, began to keep more mitzvahs as a result of my influence on their children and the children’s influence on the parents. Following that audience, I corresponded with the Rebbe periodically, and I recall sending a letter to which the Rebbe responded that he was disappointed not to hear anything about my work in the public schools. I immediately called the Rebbe’s secretary, Rabbi Leibel Groner, to say that everything was going nicely and, since there were no problems, I didn’t write anything. That’s when I was told that the Rebbe wants to hear good news too. He wants to have the pleasure of knowing when things are going well, not just when there are problems. The Philadelphia school system where I worked had a dress code that prohibited teachers from having any facial hair. But there came a time in 1965 when the Rebbe instructed me to grow a full beard. 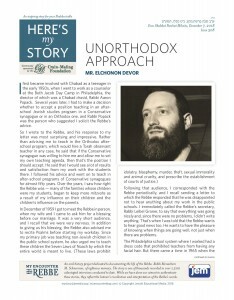 The Rebbe advocated full beards for his chasidim, following the Torah commandment, “You shall not destroy the edges of your beard.” As Rabbi Groner explained, the Rebbe had not instructed me to do this previously because I could have lost my job, but now that I had tenure, I was on safer ground to challenge the dress code. However, before I started growing a beard, the Rebbe instructed me to have someone write a letter to the superintendent of schools. This person was to say that he was interested in coming to work in Philadelphia, but that he had a beard and wondered if this alone would disqualify him from employment. I had someone write such a letter, and the superintendent responded that as long as a prospective teacher met all the qualifications, the beard would not be a problem. In 1970, I had an audience with the Rebbe to which I brought my entire family, including my wife, my eight-year-old daughter, and my four sons, ages seven, five, three and one. During that audience, the Rebbe quizzed the children on what they were learning in school, and he asked my oldest son about four-cornered garments. The term he used, arba kanfot, was not familiar to him and he was stumped. So my daughter piped up, “He means your tzitzit!” The Rebbe seemed impressed that she knew about boys’ things – that another name for the four-cornered garments with fringes, called tzitzit, was arba kanfot – and then he turned his attention to her and quizzed her on the Torah portion. I will never forget that. Although I could not see it, an innocent child could see emanating from the Rebbe a holiness which was surely there.